Her body is of rubber composition to match her head size. It has been treated against weather conditions especially the humidity. 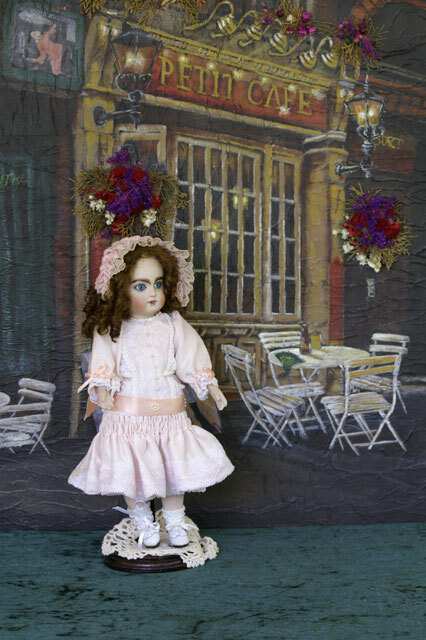 If signs of crazing occur she must be treated again for the doll to survive time. Her face is painted in a soft tone in Lady White bisz. Her eyes are 8mm Blue. 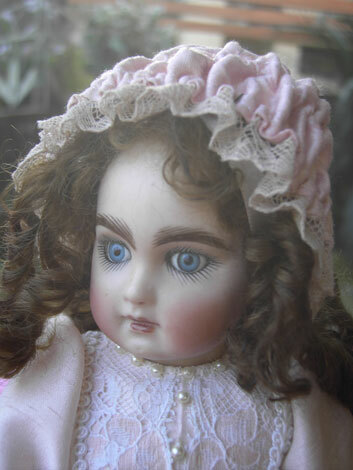 Her Lashes are straight french lashes, eye dots.French dolls are blushed softly. Ears are Pierced. Long dark brown Mohair wig in ringlet curls. She wears white leather French Shoes and knitted socks to match. Her pantaloons with open front embroidered bullion roses. Chemise is in cotton flannelette, embroidered on neckline with bullion roses to match. Petticoat embroidered same in three quarter length gathered below the waist. Her dress is satin the top is lined in softer cotton. A soft peach colouring, decorated at the front with lace, edgings and embellished the pearls going down the front and around the neckline. The style is three quarter French and edged with same lace. Sleeves are long although you can push them up, and corded with a ribbon to pull it in, tied with a bow. Around the gathered skirt is a deeper apricot Ribbon belt, finished with a pearly buckle embellishment. Her hat is colour of Apricot trim. The same for all the dolls with Mohair the hats are made to, for protection of the hair and a good idea to treat the hat so the hair is protected from moths eggs in humid temperatures to protect the hair for a long life!